What Do You Think About Axle-Less Trailer Suspension? Is it good? . . . You ask (actually a few of you are asking), so here is an answer about the Timbren Axle-Less trailer suspension. If you have not seen it, the concept is a fully independent suspension mounted on each side of the trailer. The idea eliminates the axle tube that crosses the trailer. In the pure form, it increases ground clearance and partially isolates axle input. There are various methods of axle-less suspension, but in this post we’ll discuss details of one type which uses an elastomer in compression for spring force and damping. It’s different from a torsion axle in the way the elastomer (rubber) compresses, but the properties are similar. Other manufacturers use springs and sometimes shock absorbers for the same ‘independent’ or axle-less trailer suspension. Also, one side torsion axle attachments offer a similar axle-less type function. Disclaimer, this is NOT a definitive answer about the Timbren or any other product, because I don’t have first hand experience. However, I do have good experience with other Timbren products, like their Suspension Enhancement Systems. This post is about what I read and what I see, coupled with good engineering judgement and axles 101. This is just one perspective, so use it with other available information as you make decisions. For the sake of simplicity, the comments here focus on the Timbren suspension modules, though others are similar. 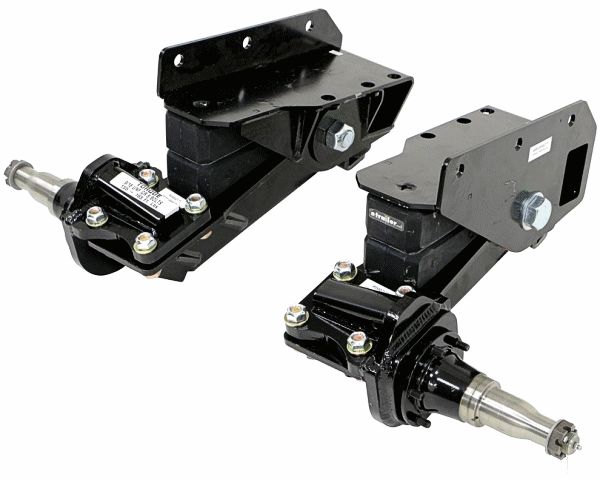 As noted above, and in the image here from eTrailer.com, the Timbren product consists of 2 modules, a left and a right, that attach to a trailer frame and provide independent suspension for a wheel on each side of the trailer. The design is a trailing arm style — generally good for stable action. The image shows both the left side and the right side oriented as on a trailer. They come with a neutral height like this one, or with a 4″ drop for a lower trailer bed height. I understand they also come with a lift for even more clearance. In general, I like the product. It’s not just a spring of rubber, they also include a chunk for rebound control. Also, the overall construction seems well thought through and stout. On their website, Timbren is fairly clear in discussing benefits. They don’t, however, get into details about where it will and won’t work, and they don’t address other things to consider with implementation. On the other hand, retailers like eTrailer.com write a bunch. The text below is a screen shot list of features from the eTrailer site. Normally I really like the great eTrailer info, but there are some misleading and even some concerning misinformation here. I circle those in RED in this image, and comment more about them below. Be very careful before you “replace your existing axle”. As in the post on loads for suspension types, there are differences in loading application for various suspensions. These are no exception. These function in some ways similar to a torsion axle, so the resulting loads on the trailer frame are NOT simple. I’m sure they can substitute on a trailer, but make sure the frame strength is right before replacing an axle with these. Also see the “Red Box” note below. Rubber definitely has some advantages for progressive spring rate and damping qualities — mostly very favorable for trailers. Just don’t be fooled into thinking that statement makes these unique. You can say the same thing about torsion axles, airbag axles, etc.. The one downside to rubber is it hardens and changes (sometimes decays) with time. That said, it takes a while. I did not notice any of that with the Timbren elastomer suspension products while on my van. Just something to be aware of. For truth in advertising, please note that a lower deck height is comparative. The lowest deck heights are typically available using torsion axles with arms at a neutral angle up. Reduction of roll in corners must be qualified by suspension motion, hysteresis and damping. If these have less total suspension travel (harder suspension), then yes, this is true to a level you might notice. However, there are disadvantages with less total suspension travel. Rubber suspensions have a natural hysteresis and a progressive spring rate. That gives a different feel to the suspension that some equate with roll control. Here’s a bad example video. Though it’s not really a reduction in roll per say, it can feel more stable during certain dynamic events. Real reduction of roll must include connectivity across the vehicle — like the torsion bars under your car. Since these don’t have that, and they don’t have dynamic stability control (electronics), and since Timbren does not make that claim, to me, this claim is concerning. See notes below. This is only true if the axle-less trailer suspension is installed straight and true. Otherwise, the opposite will happen with the trailer less stable and increase wear on tires. From my perspective, these can be great, or, if installed just a little wrong, (or if the frame is not sufficiently stiff), they will be a disaster. That means we, the DIY guys and gals, are the key to success. While this is strictly true, it insinuates that tandem axle applications are OK. Not So. I guarantee if these are in tandem on a trailer at capacity, you will have wheel, tire or bearing issues. They don’t load share, so don’t do it. If you like this suspension type but want a tandem, use the very similar Silent Ride Trailer Suspension. It is a tandem axle system. 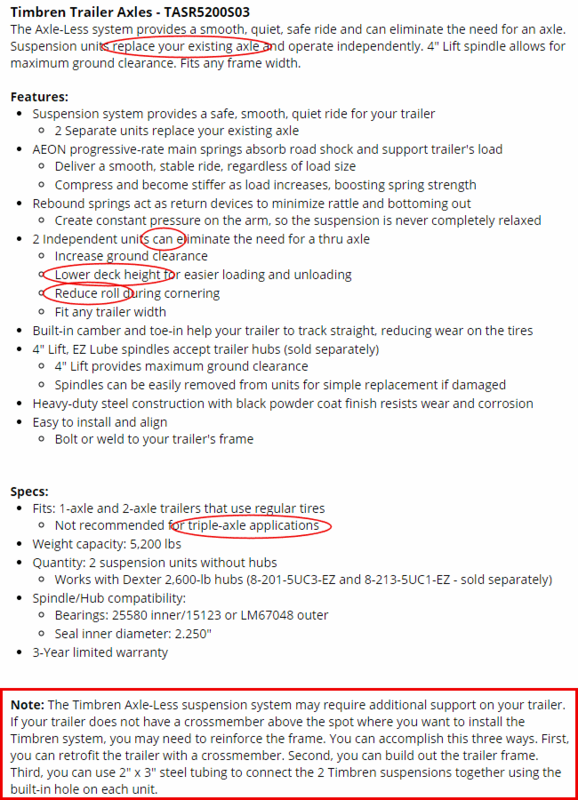 This is a very interesting note about the Timbren Axle-Less Trailer Suspension. It basically negates some of the benefits by adding an axle beam — therefore, it is no longer “axle-less”. Because the axle-less trailer suspension supports a cantilever wheel (off to the side), there are high twisting loads applied to the trailer frame. With other suspension types, these twist loads are handled by the “axle” beam. However, for these, the trailer frame must handle those loads. Again, for a trailer made for these, that’s not a problem, but as in their note, you must make the frame do it, or add the axle beam (making it no longer axle-less). I am glad they include the note because handling the cantilever suspension load is very important. Getting the installation right is the big hiccup, but also the key to success. The literature makes it seem like a breeze, but I don’t believe it is. Here are 3 keys. 1. The literature assumes your trailer beams are exactly parallel, and the hitch is perfectly at center. That is often not quite true — especially with DIY trailers. 2. It assumes the bottoms (mounting surfaces) of the main beams are coplanar (meaning flat and true with each other). Again, that is not always true. And not always a fault either, because often the main beam surface is not really flat. The best way to install these straight and true is with a jig — left and right — so they are fixed true before attaching to the frame. Even that is not a guarantee, but it’s a good start. I don’t see an easy way right off, especially considering the camber, but think about it. I’m sure you’ll figure out something. 3. As mentioned, this suspension applies a strong twist to the trailer frame beams. That requires a substantial crossmember at the location, or it will cause problems. Judging from simple calculations, the crossmember must be more than a piece of angle iron supporting the bed. It should probably be almost as big and strong as the main beams. Remember, crossmembers supporting the bed already have the bed loads to contend with. If the axle-less trailer suspension components are NOT true to each other, the trailer will NOT pull stable and true. If you mount them perfect — with sufficient frame strength — then I have no doubt this is a great suspension. Personally, I like it. And, I might just build my next trailer with a set of these just to try them out. Please leave a comment about what you think. Also, for more on axles, read about Overslung and Underslung axles. Thank you for visiting.